Unbelieving professor becomes a church planter in Brazil. Maria Jose de Oliveira Palmeir was baptized at the age of 12 in Brazil. But she left the church as a young adult, and 38 years passed before she could cast aside her faith in Marxism to become a powerhouse for God in her community. “The ideals of Marxism replaced the ideals of Christ in my life,” Maria said. Raised by a Seventh-day Adventist mother, Maria taught a Sabbath School class and served as her church’s youth director while in her teens. But she stopped going to church at the age of 22 after a prominent church member said something that offended her. Her determination not to return grew firm when no church members reached out to her. Maria immersed herself into her sociology studies and embraced German philosopher and sociologist Karl Marx’s teachings on human rights. Twenty-five years passed. Maria married, had a son, and was widowed. She moved to Montreal, Canada, to pursue post-doctoral studies at Université du Québec à Montréal. While there, she received a surprise visit from a Brazilian pastor, Luis Santana, and his wife, Leoni. Pastor Luis had attended a wedding in the United States and stopped in Montreal for eight days to see Maria before flying home. He and Maria had attended the same Adventist church as young adults. Pastor Luis and his wife visited Maria every day. They spoke about the Bible and Jesus’ love for her. They invited her to return to Christ. Maria listened politely but was unmoved. Two years later, she returned to Brazil to teach as a professor at a university. Pastor Luis’ wife contacted her every week for three years to invite her to attend a Bible study. Maria always found an excuse not to go. One day, Maria noticed while preparing for a class that Marx wrote his first manuscript in 1844. She remembered that her mother had said the Adventist movement began in 1844, and she wondered whether the devil might have introduced Marxism to counteract the Adventist message. In comparing Marxism with Adventism, she saw that Marx taught that people could change the world through their own power, and Adventists believed that people needed Christ to change. Maria usually slept well at night, but she tossed and turned the night after that class. The next day, a female student, Dinalva, approached her. Maria didn’t know what to say. “Thank you for telling me that,” she said. About two weeks later, Maria was eating lunch at a café when she heard a choir rehearsing “Maravilhosa Graca” (Wonderful Grace of Jesus) in a Sunday church next door. It was a song that Maria sang in the Adventist choir as a teen. Maria was shocked. The meeting seemed like more than a coincidence. Dinalva didn’t live nearby, and Maria had chosen a café far from the university campus. After the song finished, the two parted ways. The experience convinced Maria that God wanted her to study the Bible. She accepted the invitation of Pastor Luis’ wife to join the weekly Bible study. Maria studied with Pastor Luis and his wife for 10 years, but she couldn’t accept that the Bible is the Word of God. As the wife prayed, a desire grew in Maria’s heart to read the Bible at home. She read the Bible for two months and was rebaptized. But she had a problem. She didn’t want to go to church. “Why don’t we have meetings in a house?” she asked Pastor Luis. The two discussed the idea of establishing a meeting place for people who like the Bible but didn’t want to go to church, and the pastor asked Maria to draft a plan for such a house church. Church leaders then revised the proposal, and the house-church was born. The Sharing Jesus house church began with 13 people in 2004. It has now baptized more than 200 people. 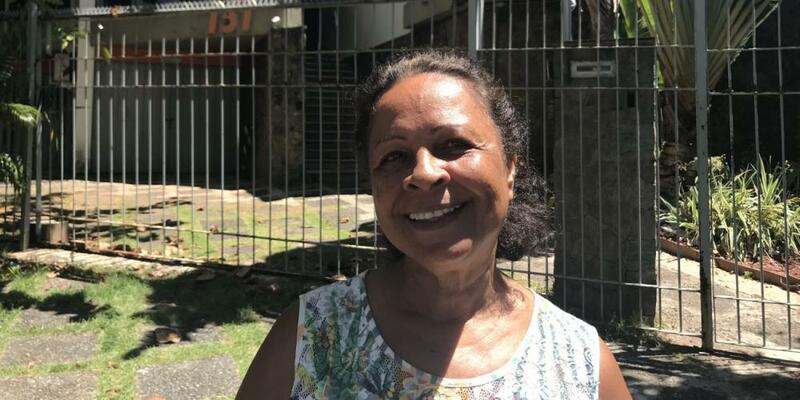 “People learn how to love the Adventist Church here, they are converted and baptized, and then we send them to Adventist churches around Salvador,” said Maria, now 70 and a co-leader of the house church. The house church will receive part of the second quarter 2019 Thirteenth Sabbath Offering to move out of its rented premises and into a larger building, where it will also offer healthy cooking classes and health seminars. May 5 - The Church with No People | Part 2 Tony and Irene have fully accepted God's call to the last frontier. They share the rewards and challenges of mission work in Alaska. ‘Why Are They Throwing Away Books? Books Are Meant to Be Read!’ Ten-year-old girl runs to Grandmother holding one of the books, “The Great Hope” by Ellen White.